Find artworks, auction results, sale prices and pictures of Vittorio Maria Bigari at auctions worldwide. 53 Vittorio Maria Bigari Black chalk heightened with white chalk (recto); black chalk (verso); bears old attribution, lower left: Vitorio Biggari and another, verso: Vittorio Bigari / Bolognese 227 by 323 mm Hinge mounted to a modern mount. There is a very faint old vertical crease to the centre of the sheet and some minor staining to the extremities due to old adhesive tape previously attached to the verso. The chalk medium remains reasonably fresh throughout this attractive sheet. "In response to your inquiry, we are pleased to provide you with a general report of the condition of the property described above. Since we are not professional conservators or restorers, we urge you to consult with a restorer or conservator of your choice who will be better able to provide a detailed, professional report. Prospective buyers should inspect each lot to satisfy themselves as to condition and must understand that any statement made by Sotheby's is merely a subjective, qualified opinion. Prospective buyers should also refer to any Important Notices regarding this sale, which are printed in the Sale Catalogue. NOTWITHSTANDING THIS REPORT OR ANY DISCUSSIONS CONCERNING A LOT, ALL LOTS ARE OFFERED AND SOLD AS IS" IN ACCORDANCE WITH THE CONDITIONS OF BUSINESS PRINTED IN THE SALE CATALOGUE." Eminent artist in Bologna of the eighteenth century, the number of his paintings alone is rather small, according to the census. Also works created in collaboration are much more numerous. The Bigari painted figures in the architecture of the Mirandolese, of Carlo Lodi and of Stefano Orlandi, and also worked in the Palazzo Aldrovandi now Montanari. We also recall the important work of Vittorio Maria Bigari in the gallery of the Palazzo Ranuzzi, in the rooms of the Palazzo Pubblico in Faenza, in the vault of the chapel in San Petronio Aldrovandi, in Archinti Palace in Milan and the Palazzo Reale in Turin (Roli in R. The The eighteenth century painting in Italy, Milan 1990 Volume II, p. 626). The painting in question was exhibited in Illinois State Museum, Springfield \`\`\`\`The Frank W. Chesrow Collection of English and Western European Renaissance and Baroque Painting\`\`\`\` with attribution to Sebastiano Ricci. Anonymous sale; Artcurial, Paris, 19 December 2006, lot 6. Anonymous sale; Artcurial, Paris, 19 December 2006, lot6. A compositional study for one of the eight tempera pictures inS. Domenico in Bologna, which were commissioned from Bigari in 1732after renovation under the supervision of the architect CarloFrancesco Dotti. The pictures, set in arch-topped frames and placedabove the arches of the nave, illustrate major episodes of theDominican Order and the history of the Church. The programme of thepainted cycle was provided by the lawyer Alessandro Macchiavelli(see C. Casali Pedrielli, Vittorio Maria Bigari. Affreschi,dipinti, disegni, Bologna, 1991, pp. 28, 95-6 and 153, no.17). The present drawing is a study for The Consecration of the Churchof San Domenico by Pope Innocent IV on 17 October 1251 (fig. 1).The marble sarcophagus placed at the centre of the scene containsthe remains of Saint Dominic, founder of the Order of Preachers. In1267 the remains of Saint Dominic were moved to a shrine decoratedwith the main episodes in the life of the Saint by NicolaPisano. 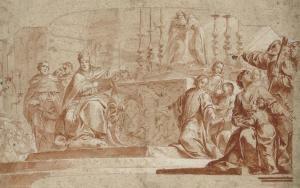 The number of preparatory drawings that have survived shows theimportance that this commission had for Bigari's career. One ofthese drawings, Bartolomeo di Braganza founding the Order of theGaudenti Cavaliers, is in the Bibliothèque municipale, Besançon(inv. no. 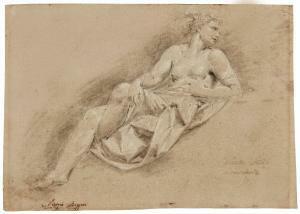 A37; see Le Génie de Bologne des Carracci aux Gandolfi:dessins des XVIIe et XVIIIe siècles, exhib. cat., Rouen, Musée desBeaux-Arts, 2006, no. 103), and Cardinal Baldassare Cossa donatinga relic to the church is in the Staatsgalerie, Stuttgart (TheSchloss Fachsenfeld collection, inv. no. III/175) (CasaliPedrielli, op. cit., p. 153, no. 53). 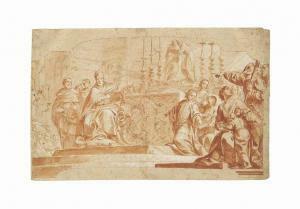 More recently, two sheetswere sold at auction, Charles IV conferring an honour on aDominican (Sotheby's, New York, 12 January 1990, lot 54) and Thecelebration of the Eucharist (Sotheby's, London, 8 July 1998, lot145). As in all these sheets, the present drawing presents the samearch-topped shape that follows that of the completed painting, andthe composition is at an advanced stage that does not differ muchfrom the finished work. The highly finished quality of all thesedrawings makes it plausible to think that they probably served asmodelli for presentation to the patrons of the church. C.R. 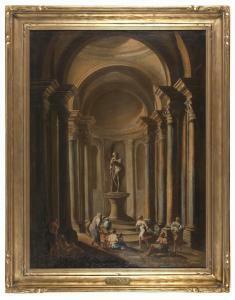 Rudolf (L.2811b); Sotheby's, London, 19 May 1977, lot 111, as Giuseppe Marchese, il Sansone. 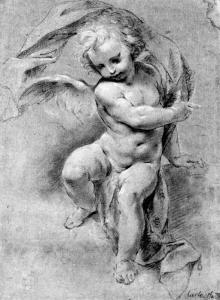 A study for a putto in one of the pendentives of the cupola of the Buoncompagni Chapel in the Metropolitan Church of Saint Peter, Bologna, completed in 1730, C. Casali Pedrielli, Vittorio Maria Bigari, Bologna, 1991, no. 14, illustrated.